God is frequently invoked in American public life. Indeed, there is no shortage of instances of official acknowledgement of the divine, from the appearance of “In God We Trust” on our currency to the phrase “one nation under God” in the Pledge of Allegiance. To be sure, the vast majority of Americans still believe in God. But there are strong signs that many are less certain about this belief than in years past. And a small but growing minority of Americans say they do not believe in God at all. When asked if they believe in “God or a universal spirit” in the Pew Research Center’s 2014 Religious Landscape Study, 89% of U.S. adults say yes – down from 92% from the previous RLS in 2007. Nearly one-in-ten (9%) now say they don’t believe in God, up from 5% in 2007. The changes have been even more substantial when it comes to certainty of belief in God: 63% of Americans are absolutely certain that God exists, down 8 percentage points from 2007, when 71% said this. These shifts have been especially sharp among the growing share of Americans who do not identify with any religious group (and call themselves atheists, agnostics or “nothing in particular”). While 22% of these religious “nones” said that they did not believe in God in 2007, that figure has risen to 33% in 2014. 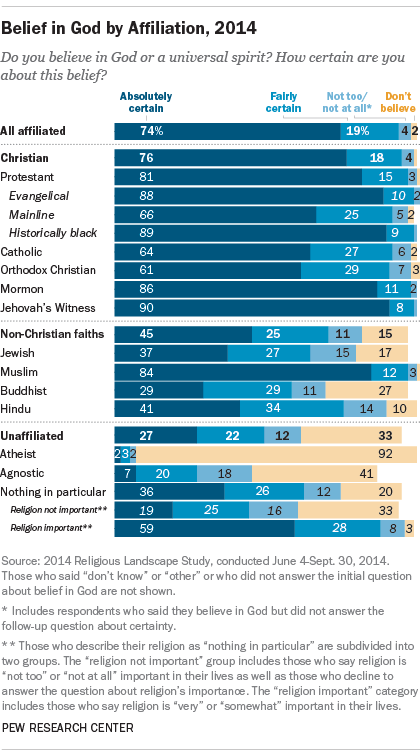 And just 27% of the religiously unaffiliated are absolutely certain that God exists, down from 36% in 2007. But a lack of certainty in God’s existence has become more common even among some Christian groups and members of non-Christian faiths. For example, two-thirds (66%) of those in the mainline Protestant tradition now say they are absolutely certain that God exists, down from 73% in 2007. A similar trend is seen among Catholics: 64% expressed an absolutely certain belief in God in 2014, compared with 72% in 2007. And among those who identify as Jewish on the basis of religion, the share saying they do not believe in God at all has risen from 10% to 17% over this seven-year period. This trend is not universal. Indeed, belief in God has been more stable among some more highly observant religious groups, such as evangelical Protestants and members of the historically black Protestant tradition – among whom nearly nine-in-ten say they are absolutely certain God exists. And 84% of U.S. Muslims are certain there is a God or universal spirit, similar to 2007 (82%). There are other demographic differences as well when it comes to belief in God. For instance, blacks are more likely than whites and Hispanics (83% vs. 61% and 59%, respectively) to be absolutely certain about God’s existence. Women are more likely than men to be certain about God (69% vs. 57%), as are less well-educated Americans compared with college graduates (66% vs. 55%). But perhaps the most striking divide – and the driving force behind the overall drop in belief – is generational. As younger Americans enter adulthood, they are far less likely to be sure about God’s existence than are their elders. While 70% of those ages 65 and older express an absolutely certain belief in God or a universal spirit, only about half of adults under 30 feel the same way (51%). Pew Research Center surveys are not the only ones that have found a long-term decline in the overall share of Americans who say they believe in God. For example, 86% of Americans said in a 2014 Gallup poll they believed in God or a universal spirit, down from 96% in 1994 and the lowest figure since Gallup first asked the question in 1976.